Have you ever considered cardboard furniture?! Yes, it’s amazing! But seriously, if you would’ve just point-blank asked me “why don’t you buy some cardboard furniture for your new home?”, I would have looked at you like you were out of your mind. I’m not 10 years old anymore – I’m not looking to play in my cardboard make-believe house or live in a refrigerator box. I’m a grown-up now! But I stumbled upon the coolest cardboard bed frame one day and it got curious. Are companies making other furniture out of cardboard? After spending hours and hours falling down this cardboard furniture rabbit hole, I am now officially in love with what’s available. There are definitely a few cardboard items on my new home wishlist, including cardboard cat furniture! Take a look at some of these cardboard furniture options below. They are so creative and surprisingly stylish. I am super excited about them, and I think you will be as well. The KARTON group is a New York based company (shipping to USA & Canada). They offer 100% recyclable cardboard furniture for the bedroom (bed frame + drawers, dresser, closet), office (desk, bookcase, shelving), and dining room (bistro table, stools). When I move next, I’m definitely getting one their beds – it looks so easy to build (no tools or glue required), but so sturdy at the same time. Update: Unfortunately the USA division has gone out of business now. The KARTON group has established itself in Australia now. Support the group if you believe in a mission of making furniture out of cardboard. I love their cardboard animals – they are so cute and they must be so fun to build. It’s like a 3D puzzle. 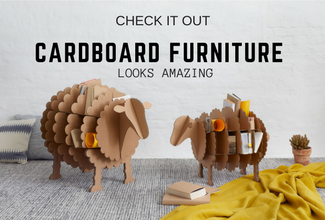 You can order the same products and more (including the cutest full-size cardboard sheep, or turtle pencil holder) via Stange Design GmbH. Famous OTO creates large cardboard playhouses for children and small cardboard playhouses for cats. Take a look at their selection – I bet they will make you crack a smile. Considering I don’t have any kids but want an excuse to get one of these cute cardboard playhouses, I definitely want to get some cardboard cat house! chairigami dubs itself as the cardboard furniture for the urban nomad. From chairs to tables to desks, for kids and adults, it seems there is a product for everyone here. If you move a lot and are looking for lightweight furniture, this is definitely a great option. The products are made from 70% recycled cardboard and 30% FSC certified virgin fiber. Check out the cardboard chairs for sale by this company – so simple and effective. Made in the USA. Architect and designer, Tobias Horrocks, has designed 2 consumer products: (i) a customizable, modular bookshelf, and (ii) 4 stool set that can be combined to form a bench. The Carton Lab, based out of the USA, makes cardboard furniture that will definitely appeal to young kids. With various stools shaped like animals, or a cardboard house turned bookcase, the Carton Lab is definitely bringing creativity to the table. They haven’t forgotten the adults though – check out their wine rack chair! Once you’ve picked out your furniture and are ready to decorate your house, take a look at Cardboard Safari’s products. From rocket tables to (cardboard) animal heads, to creative cardboard cat scratchers, you’ll definitely find at least one product that you love. I will most likely get the Mt. Fuji or the mustache scratcher for my cat… Made in the USA! Cardboard furniture and decor looks so amazing! And based on techniques sourced from origami, it is so strong for its weight. Cardboard definitely has many benefits: it’s light-weight, easy to transport, low-cost, foldable, biodegradable, and recyclable. In addition to adding earth-friendly functionality and creative design to your home, it adds a unique flair that IKEA furniture just cannot bring. Perhaps having cardboard furniture will eventually inspire you to try your hand at DIY cardboard furniture too. Because Amazon customers know all too well how much cardboard they have on hand from online purchases. Am I right? !